Cellular Internet connectivity is becoming more and more popular. So much so that a lot telcos are reporting problems keeping up with the demand. But to make matters worse the telcos, at least in North America, are gouging there customer base with ridiculous fees. Before we get into what the solution to this problem is, let’s just take a quick look into the telco pricing model. Thanks to an associate of mine who is the head IT administrator for an extremely large newspaper publishing house, I now know that Telus’ wholesale cost on talk time is 0.0018 cents per minute. That’s right, it’s not a typo, 0.0018 cents a minute. My associate, because his company does over 1.4 million in business per year with Telus was able to negotiate a flat rate of .002 cents a minute for the entire organization, and just to be clear… yes this is cellular talk time we’re talking about here. The problem is that the telco industry is an old boys club that’s very very hard to penetrate. Not only from a consumer perspective but from an industry perspective as well. As a small business owner trying to work in the cellular space I can attest this statement. Implementing change or getting an answer to fairly basic question can be a monumental task when dealing with these companies. Which brings me to the problem within the telco pricing model. The cost of data allocation. Take for example a family plan. There are multiple handsets that pull from a collective pool of minutes. When the pool is expunged the minutes are charged per, nothing like this exists for data. If you own an iPhone with a data plan and a rocket stick with a data plan they’re two separate allocated pools of data. 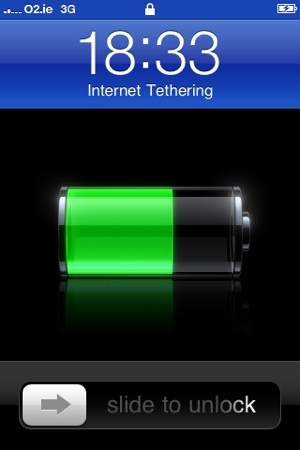 What if you could get a cell phone plan and attach as many devices you like to it. An iPhone, a rocket stick and cell modem in your home. You could pay for one plan and use the allocated minutes and data for not only your cell phone but also your home Internet connection. Wouldn’t that be grand? Yes yes, I realize I haven’t posted in almost two months. I feel awful about it. I’m not gonna sit here and be like most bloggers “updates are coming yada yada” cause I know if I say that it’ll be another two months before I make a post. The good news is that Luke over at Zymeworks is ready to donate the switches to Free Geek so I’ll be able to finish that series up soon. I’m hoping to get over there on Tuesday to do the next steps. But for now, on to more important things…. 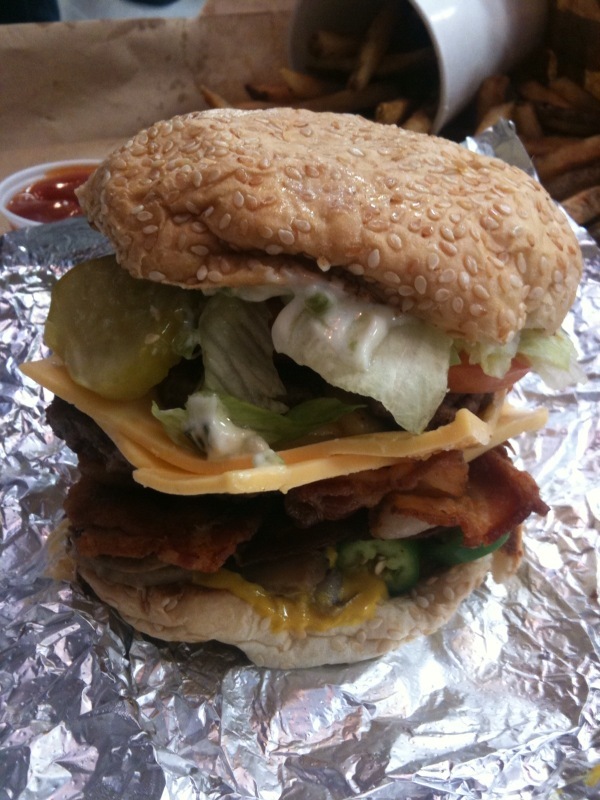 This is the bacon cheeseburger from Five Guys Burger and Fries. There are many different styles of hamburger out there. There’s the restaurant style where you feel like you should eat it with a knife and fork. The backyard bbq style where everything is fresh and yummy, and the fast food style where everything is fake and preprocessed. But what if you made a fast food style burger but only used fresh ingredients, never frozen beef, fresh bread. What if you made a fast food burger that had mayonnaise chosen from a blind taste test from 15 other mayonnaises? What if you had pickles that were far superior than any other pickle before? What if you could chose your toppings from a selection that puts Harvey’s to shame? Well you would have the five guys burger. This family owned and operated franchise chain is taking North America by storm with even the president himself taking a bite. I decided to try it last night with my always willing roommate and let me tell you. It did not disappoint. If you need that fatty fix and want something fast foodish, but with good quality ingredients. Here it is. The restaurant is West Vancouver in Park Royal. Check it out.